I was so excited today when I opened up my email and I had a message from the American Heart Association. 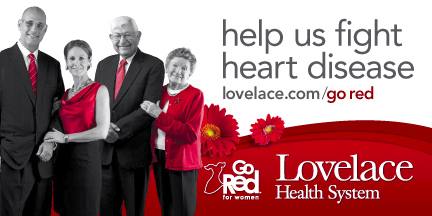 They just got the proofs back from their ad agency for the new billboards that I shot for the Lovelace Hospital heart disease awareness campaign. I only have the low res proofs, but I wanted to share just a few of them with you. You can see the real thing on Feb 15th when all 12 billboards go up around the city! Each of these men and women are generous local donors of the American Heart Association and are members of the Circle of Red. 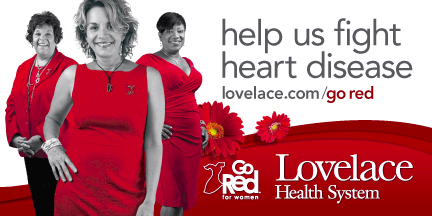 Check out the campaign at www.Lovelace.com/GoRed !! Wednesday, February 22, 2012 from 11am-1:30pm at the Hotel Albuquerque located at 800 Rio Grande Blvd. Space is limited, and we are expecting a sold-out event this year, so get your sponsorships, tables or tickets secured today! For more information, visit www.heart.org/albuquerquenmgoredluncheon or call Kathi Bradley at 353-5800, or 353-5818.